An angry, googlie-eyed Hillary demands to know why she isn't further ahead in the polls. 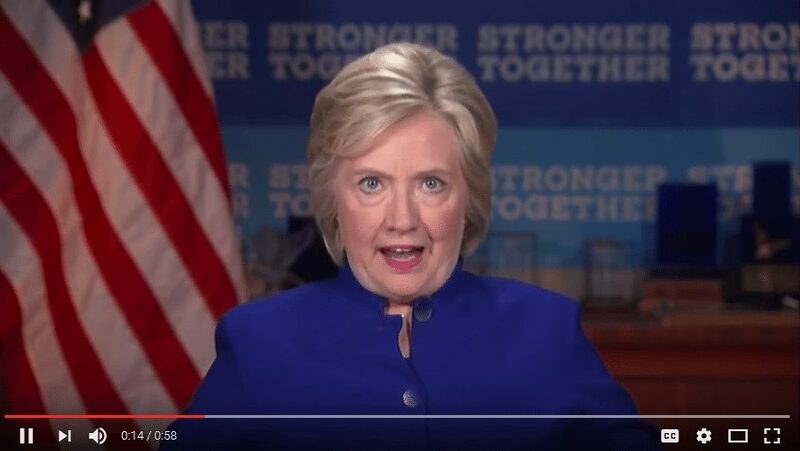 Googlie-eyed Hillary screams: Why aren’t I 50 points ahead? Earlier today, TK Whiteman observed that Democrat Hillary Clinton, perhaps the most evil person ever nominated to the White House by a major party, seems to have a problem with her “googlie” eyes. The same day, Breitbart reported that Hillary — googlie eyes and all — appeared in a video to the Laborers’ International Union of North America in which she demanded to know why she isn’t further ahead in the polls. “Why aren’t I 50 points ahead” of Trump, she screeched. “Stop yelling at me, grandma,” one person said on YouTube. It could also be due to her 40-year career of lying and scheming her way to the top. Or her constant scandals and efforts to skirt laws that would get others thrown in jail. It could be that she’s so unlikeable that no one can stand to have this lecture us for four years or more. It’s also possible that she’s shown so much hatred for average Americans that she actually loses support every time she opens her mouth. Or maybe voters are concerned that she might not be able to survive four years in the Oval Office. There’s a number of possibilities, not the least of which is that Americans are tired of seeing the country destroyed by a radical Marxist and are determined not to elect another. Previous articleWhat’s up with those Clinton googlie eyes?